The Dilemma of Private Collectors..
People tend to preserve things that they ‘treasure’ personally or which they believe, ‘will have the potential to return a windfall in the future’. From a social perspective, institutions like ‘Libraries’ and ‘Research Centres’ preserved material in the interests of the society, all though some ‘private ones’ were driven by ‘motives of profit’ as well. But within this framework lay a sort of power – ‘the power to hold information.’ It enhanced the value of the ‘individual’ or the ‘organisation’ immensely. It meant that ‘individuals’ desiring in accessing this information were at the behest of the former. The ‘former’ could cut off ‘access to information’ at any time. Since the material was in physical form, either in paper – ‘magazines’, ‘newspaper clippings’, ‘books’ ‘pamphlets’; film – ’35mm’, ’16mm’, ‘8mm’, ‘VHS Tapes’ or ‘microfilm formats’, the ownership lay in entirety with the current possesioner of the material. Since the ‘individual’ would in all respect, have paid both ‘access and maintenance costs’ ( or obtained donor copies from someone else), they held absolute rights to the material. The holding of such rare material was almost like ‘access to private property’, and the owner could prevent access to any ‘trespasser’ at any point in time. Another factor that needs to be mentioned in this is that the ‘borrower’ who wished to access such materials in this case, in most cases, did not have the infrastructure for ‘duplication’ or to ‘store and preserve material even if duplicated’ in most cases, especially if it dealt with film material. With the advent of digital technology however, the power of ‘reproduction of any material in any form’ and its ‘subsequent storage’ of such digitized content has passed to anyone, almost like the air, that we breathe. This has brought a sea change in the attitude of some ‘individuals’ and ‘organisations’. The fear that their content may be reproduced in digital form and taken out into the world, fears them.If that happened, no longer would they have absolute ownership of the material, in real world terms. Some of these owners, have rare material, whose copyright have long expired. An attempt at monetization in any form today, will invariably lead to duplication. ( I refrain from using the word ‘piracy’, unless the owner is the ‘copyright holder’ of the ‘material in posession’). Should such content be ‘duplicated’ and ‘disseminated’ during the process of monetization, The owner can do nothing . So, they tighten ‘access’ even further. It is agreed that many of them have invested heavily in acquiring such ‘rare’ priceless material, but with the ecosystem having changed, there is nothing that can be done to further, their cause. Either, they continue to ‘hoard’ material, without it being of benefit to no one, or they take the better stance in common sense, of allowing ‘desiring individuals’ access to information, for the benefit of enhancing the societies common knowledge. While Speaking with Shivangini Tandon, a researcher who is working on Director Jyotish Sinha, she tells me of a person who she had met in Sri Lanka, who has copies of the Sri Lanka film ‘Kapati Arakshakaya’ made by K.Subhramanyam ( Co directed by Jyotish Sinha), but is hesitant in letting out prints. The same person has uploaded a couples of the movie on YouTube. This is my own experience that I have of a ‘public Research centre, owned by private backing’. Without doubt, it does have the best facilities and is easily accessible for a layman without any hassles. The support staff are also very helpful in bringing out any content for Reference. Thank God! But when it comes to ‘reproduction’, they take a back seat. Some of the old magazines are breaking ( turned brittle) and filled with Termite holes. I asked them a xerox copy of some pictures from one such magazine, which they refused me. Fair enough. But can content not be shared without causing further physical damage, if one resorted to Digital methods? It most definitely can, if one possessed the right attitude. Another instance of ‘reproduction’ turned down was when I requested for xerox of a couple of pictures of a magazine printed two years ago, was turned down. I was refused denial plainly and I was told that if I desired it ( since I was desperate!!! ), i would have to Contact the publisher directly 😦 ( This was in stark contrast to my experience at the NFAI. The library staff there are way ‘too sweet’. Sounds cheesy maybe ,but no other adjectives fit them better!!!). This entry was posted in Contemporary Events, Film Distribution, Golden Oldies of Tamil Cinema, LOST TAMIL CINEMA, THE ARCHIVES, The Future of Tamil Cinema?, Uncategorized and tagged 35mm Tamil Film Reels, ARCHIVES, D.V.Balakrishnan, Director Jyotish Sinha, Director K.Subrahmanyam, Kapati Arakshakaya Srilankan Film, Libraries, Media Distribution, Media Preservation, Research Centres, Right to Information Access, Shivangini Tandon, Tamil Movie RajaMukthi M.K.Thyagaraja Bhagavathar, The Internet, VHS Technology on March 2, 2017 by Sugeeth Krishnamoorthy. Theodore Baskaran is a Film Historian and author of several books. You can find more details about him and his work, in this Wikipedia Link. This entry was posted in KTP-Exclusive Interviews, TAMIL CINEMA, THE ARCHIVES and tagged ARCHIVES, BAN THE FILM, OLD FILM REELS, THEODORE BASKARAN on April 6, 2015 by Sugeeth Krishnamoorthy. While a few movie makers like ManiRathnam have chosen to use the base story line of a section of mythological stories like Ramayana and Mahabharata, which have been in the Public Domain since Centuries, others have chosen to adapt The screenplay of several hundreds ( possibly thousands) of movies have been adapted from contemporary forms of literature. 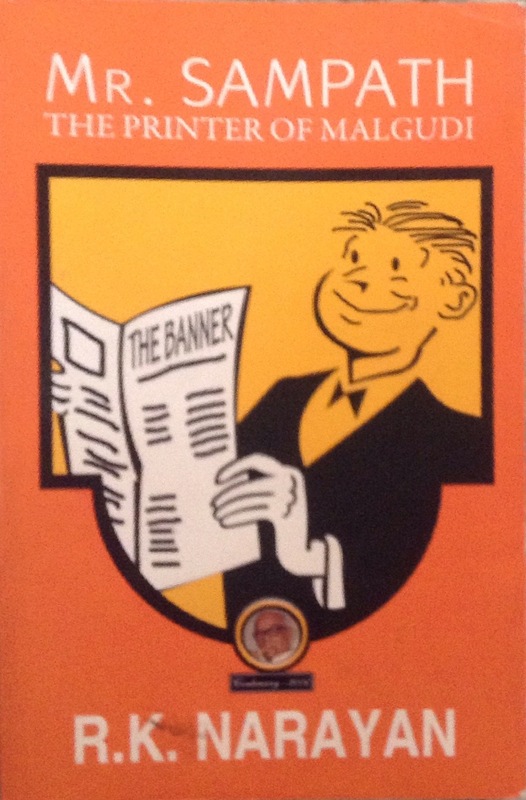 Uthiripookal is a classic example. It was adapted from PudumaiPithan’s Sirranai. 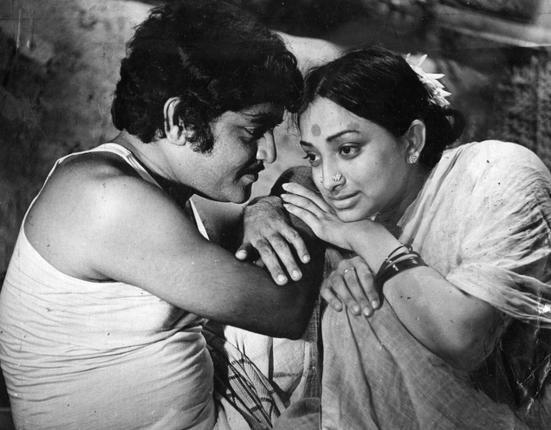 Infact, several of Mahendran’s movies have been adaptations, including Metti, which was adapted from one of Mahendran’s own Short story. While the creator of traditional book based literature has infinite scope in terms of space and extensive characterisation and story telling, a film maker is bound in terms of a finite time duration and has certain limits, on certain elements that may not have been possible to express impressively on the big screen at the time, of a film’s making. 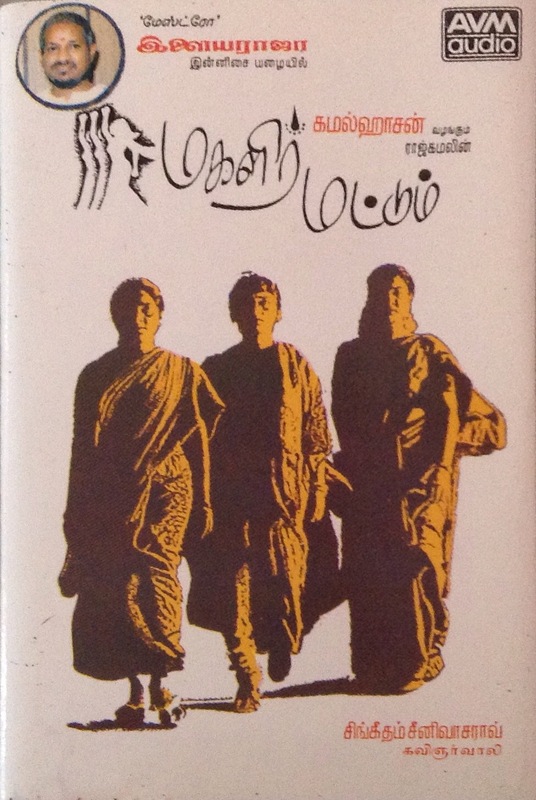 JayaKanthan’s ‘Unnai Pol Oruvan‘ and ‘Yaarukaga Azhuthan‘ are adaptations of his own stories, directed by himself, while others like BheemSingh and Lenin have chosen to take his stories to the celluloid through ‘Sila Nerangalil Sila Manithargal’ / ‘Oru Nadigai Nadagam Parkiral‘ & ‘Oorukku Nooru Per‘. Sadly, many of these movies are still not accessible to the public via afford Digital Media, although some of them sit in Cans of the NATIONAL FILM ARCHIVES OF INDIA, costing a bomb for private individuals/researchers who wish to view them, at the centre itself, which makes little sense when a low cost Original DVD of the same movie, can be sold for Rs.50. So, looking back at a movie’s true source, will give us an indication of how much an adaption could have varied from the original. It also immensely helps us understand movies, which in case have been permanently lost, but the original literature is available. Let us consider the classic case of ‘Miss Malini’. A Movie produced by Gemini Studios and Directed by KothaMangalam Subbu, over seen by the legendary S.S.Vasan. 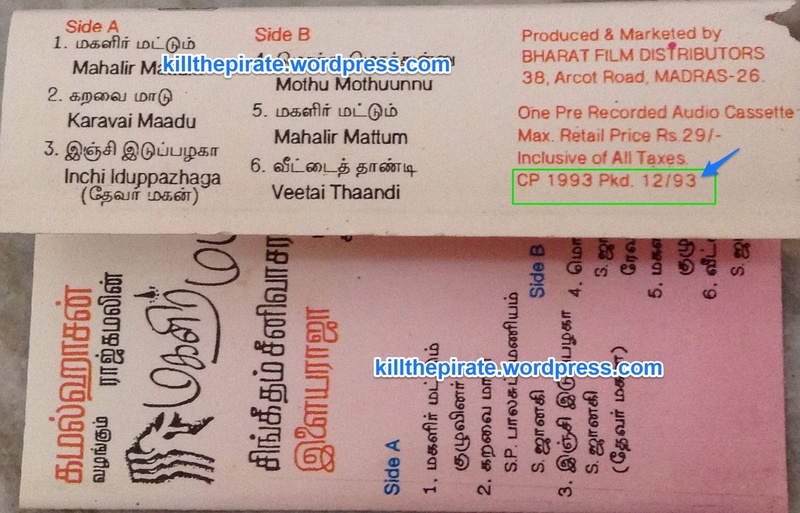 Paimpozhil Meeran in his book – ‘Secrets of Tamil cinema’ claims that a Nitrate based copy of the film which existed in the archives was destroyed in the Fire of 2002, which engulfed several copies of older films, including Miss Malini, leading to its permanent destruction. However, this is debatable. Not only does the archives claim that all the Nitrate films were backed up, The Founder Director of the Archives Mr.P.K. Nair said that by 1963, the year the NFAI was setup, Several movies, including the original Talkie, Alam Ara, were already lost. Let us take another scenario. Amrit Gangar is a researcher who has worked on the Archives and assessed the extent of damage to old Preserved Films, produces a list of movies which were damaged by the Fire. Miss.Malini is missing from the list. So, does that mean, Miss.Malini was never there in the original collection to begin with? Wait.. a moment.. The list mentioned by Amrit Gangar speaks about a Tamil movie ‘Sakubhai’ which was lost. However, the current Database available at the NFAI ( Accessible via the website) and which has details of movies upto the year 2004, and which was probably re-assesses after the 2002 Fire accident, shows that Sakubhai is available. So, which of these stories is true? While, the status of the other movies, especially the Nitrate based ones made before 1950 have indeed been destroyed by the fire, One thing almost seems to be sure. Even, the famous Historian Randor Guy has commented that ‘Miss.Malini’ is indeed lost forever. This entry was posted in LOST TAMIL CINEMA, TAMIL CINEMA, THE ARCHIVES and tagged ARCHIVES, DIKKATRA PARVATHI, INDIAN MYTHOLOGY, JAYAKANTHAN, LOST FILMS, MAHENDRAN, MANIRATHNAM, METTI, MISS.MALINI, MR.SAMPATH, NATIONAL ARCHIVES FIRE INCIDENT, PUBLIC DOMAIN, R.K.NARAYANAN, SINGEETHAM SRINIVASA RAO, Tamil Cinema, UTHIRIPOOKAL on April 1, 2015 by Sugeeth Krishnamoorthy. These tapes were lying around for quite some time, and barring their usage in a couple of video edits, I did nothing with them. So, i decided to catalogue the various attributes of these tapes into a database, i started observing several things.. But that is for another day.. But amongst one of the tapes, i found something interesting. A Gift from AVM’s audio company wishing its fans, a Happy New year, while promoting its (possibly) upcoming movie, Sethupathi IPS, at the same time. 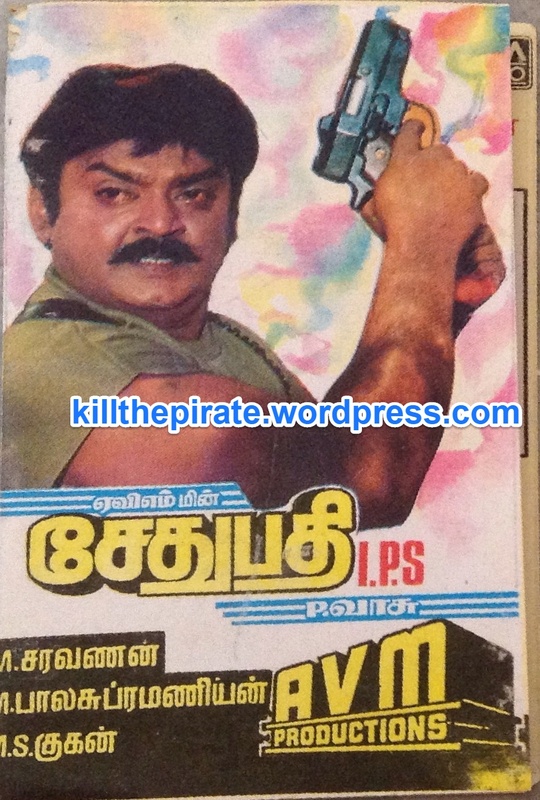 In December 1993, The Audio Release Tape for the Kamal Hassan Starrer – ‘Magalir Mattum’ has been released. The Cover mentiones that Singeetham Srinivasa Rao is the Director of the Film, Ilaiyaraja has composed the music and Vaali has taken care of the lyrics. The movie has nothing to do with the AVM company, but from the audio tape, i probably conclude that they have obtained the necessary distribution rights for the audio. It has been released in December of 93, which means that New year 1994 is around the corner.. And this is what, i found inside the tape. 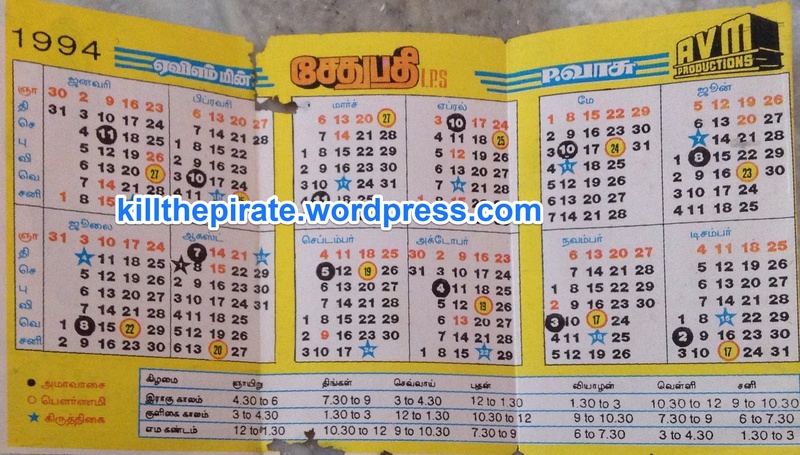 This entry was posted in ARCHIVES, AUDIO, AVM, ILAIYARAJA, TAMIL CINEMA and tagged ANALOG ERA, ARCHIVES, AVM, Ilaiyaraja, TAMIL AUDIO, Tamil Cinema on March 25, 2015 by Sugeeth Krishnamoorthy.